The boys are getting back in the groove of things – that includes on the road, on the podcast, and on the dance floor. But is there such a thing as too much of a good thing? Yes. Yes there is. The exact moment Steven’s foot got re-injured. 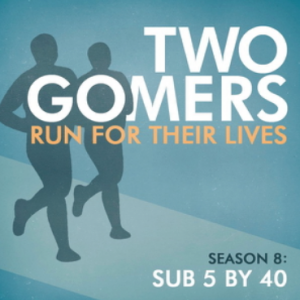 Join the Gomers as they spend time talking about their last week in running, traveling all over the country last weekend, going (or not going) vegan, gearing up for a training plan, and yeah, Fall TV. And more Fall TV. Oh THAT’S where the cameras are. This week’s (cheesy) Monday Survey: What’s your favorite part about running in the fall? Enjoy the podcast, and Happy Running! Amazing! I always wondered about those helicopter shots and whether they got sunscreen. Oh and about Jeff Probst – he is the best and my husband loves to quote some of the phrases he uses over and over (especially “Come on in, guys!”). Do you guys do that too?